They jostled, threw stones, and issued threats against each other but not even a single shot was fired. Asia’s two nuclear neighbors, India and China, managed their border dispute well and in a responsible manner. 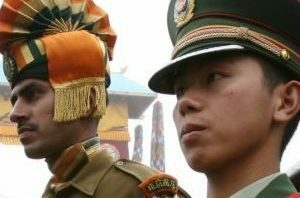 Though China indulged in a lot of sabre-rattling to force India to withdraw, India exercised commendable restraint and persisted with its opposition to China’s efforts to unilaterally redraw the borders. China, of late, has been trying to grab its neighbors’ lands and seas through flexing its military muscle. The decline of the United States as a predominant power in this hitherto unipolar world has also emboldened China to act in a macho manner to expand its territory. India and China, though fall under the category of developing countries, spend a large amount of money on defense. India procured nuclear weapons and spending billions of dollars on importing conventional weapons. All this money could be better utilized to bring about improvement in the lives of the people who are leading squalid lives in the numerous slums spread all across the country. It is also a fact that China is years ahead in technology, industrialization, and military modernization and fares far better than India in many developmental parameters. It, therefore, appears to be not ready to put all its achievements at stake and go for an avoidable war with India. Even India, with its teeming millions leading squalid lives and rampant corruption and misgovernance plaguing its society, is not in a position to wage a war against a formidable force such as China. India, though it boasts of maintaining a vast standing army, is not able to tackle its north-western neighbor, Pakistan, which is making it bleed through a thousand cuts by sponsoring cross-border terrorism. Against this backdrop, it would be over ambitious on India’s part if it feels that it can achieve something by escalating a conflict situation with China. The Doklam episode should make people and nations realize the fact that in this age of Weapons of Mass Destruction (WMD) and ultra-connected globalized world no one can act irresponsibly. The spread of nuclear, chemical and biological weapons created a situation, where it is impossible to wage a war without suffering collateral damage. Humanity survived the first and second world wars mostly because there was no wide spread possession of nuclear weapons and the US, which was the only country to possess a nuclear weapon during the Second World War, emerged victorious by using it against Japan. Now the situation, however, is entirely different. The nuclear proliferation and falling of these weapons in the hands of the rogue nations such as North Korea and Pakistan has made this world certainly more precarious. It is highly unlikely that the humanity will survive if a Third World War breaks out. One more reason behind India and China settling their dispute through diplomatic channels appears to be economic. China has a strong manufacturing base and the people in India prefer Chinese products owing to their inexpensive nature. Even India is trying to build a robust manufacturing base in the expectation that it would provide employment opportunities to its teeming millions. The geographical proximity of these two Asian neighbors made them inextricably intertwined with each other both politically and economically and therefore, are not in a position to go to a war. There are hot heads on both sides of the borders who indulged in a lot of warmongering but their attempts to unleash a nationalistic hysteria to trigger a war was finally overwhelmed by sensible measures taken by the conciliationists. Let us all hope that the peace will prevail all along India’s border for a long time if not perpetually. This entry was posted in World and tagged China, Doklam crisis, India on September 1, 2017 by Dr. Ramachandra Reddy.